A blend of essential oils to clear airways. doTERRA Air is a remarkable blend of essential oils including Laurel Leaf, Peppermint, Eucalyptus, Melaleuca, Lemon, Cardamom, Ravintsara, and Ravensara. doTERRA Air maintains feelings of clear airways and easy breathing while minimizing the effects of seasonal threats. 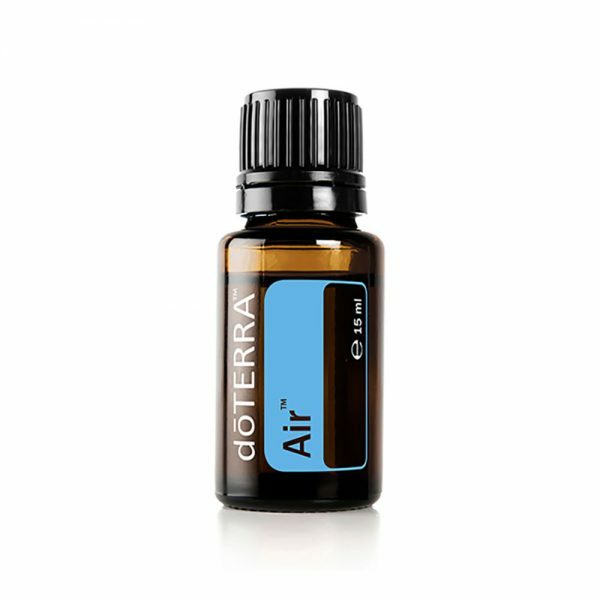 doTERRA Air can be applied topically to the chest, back, or bottom of feet, or diffused at nighttime to calm the senses and promote a restful sleep. – Diffuse, inhale directly from palms, or rub on chest or feet when seasonal and environmental threats are high. – Use when outdoors to minimize the effects of seasonal threats. – Diffuse at bedtime for a restful environment. Founded in 2008, doTERRA was built on the mission of sharing therapeutic-grade essential oils with the world. Having seen for themselves the incredible benefits that can be had from using these precious resources, a group of health-care and business professionals set out to make this mission a reality. They formed a company and named it doTERRA, a Latin derivative meaning “Gift of the Earth.” doTERRA is the world leader in sourcing, testing, manufacturing and distributing CPTG essential oils. They now have more than 5 million customers. The first hurdle to overcome, however, was to establish a standard of quality in an industry that had never had one. It wasn’t enough to simply provide essential oils to homes around the world; the doTERRA founders were committed to providing only the highest quality and purest essential oils so that families could know with surety that they were using only the best to promote health and wellness for their loved ones.